Hills surround Haiti's capital, Port-au-Prince. Haiti's ambassador says "little flimsy houses" cling to the hillsides. Raymond Alcide Joseph calls quake "a catastrophe of major proportions"
(CNN) -- Haiti's infrastructure was among the world's worst even in the best of times, the country's ambassador to the United States said Tuesday. "It was a catastrophe waiting to happen," Raymond Alcide Joseph told CNN from Washington shortly after a 7.0 earthquake leveled parts of his home country, cutting power and phone lines in the capital city of Port-au-Prince. "Sadly, it has happened." He called the result "a catastrophe of major proportions." The capital city is surrounded by hills to which "little flimsy houses" were struggling to hold on, he said. Frank Williams of World Vision Haiti told CNN from the Petionville section of the capital that the building in which his organization is based shook for about 35 seconds and did not weather it well. "Portions of things on the building fell off," he said. "Fortunately for us, our building remains standing and none of our staff were injured, but lots of walls are falling down. Many of our staff have tried to leave, but were unsuccessful because the walls from buildings and private residences were falling into the streets." In the capital, government buildings were damaged, phone service was spotty and electricity was out, except for people who had emergency generators, Williams said. The quake's impact also shook the psyches of residents, particularly when aftershocks occurred, he said. "If there is another aftershock, there is a kind of wail as people are very frightened by it," Williams said. "But most people are out in the streets and just kind of looking up." Joseph said he had spoken with Secretary-General Fritz Longchamps, who told him buildings collapsed on either side of him as he walked along a street in Petionville. Catholic Relief Services, international relief agency based in Baltimore, spoke briefly with their person in charge in Port-au-Prince before the line went dead. Regional Information Officer Robyn Feiser said the representative told them "it's a total disaster." She quotes him as saying, "I never felt anything like this. It was a major hit, and it was direct." He told Robin their building was shaking but still standing, but the building across the street from them collapsed. He described a cloud of dust everywhere, and people moving into courtyards to get away from buildings. 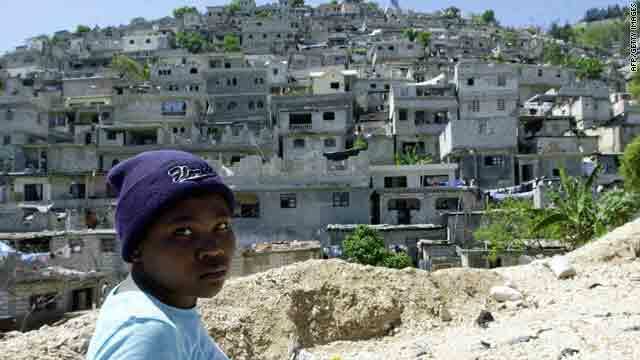 Eighty percent of Haiti's 9 million residents live under the poverty line and more than half -- 54 percent -- live in abject poverty, according to the CIA Factbook. In 2008, four tropical storms damaged the transportation infrastructure and agricultural sector, on which two-thirds of Haitians depend, mainly as subsistence farmers. Citing that World Bank assessment, the Organization of American States said in a report on its Web site, "Among the numerous factors explaining the extent of the loss of lives and goods are the absence of land use zoning and building guidelines, and comprehensive enforcement mechanisms." The OAS report added Haiti has no national building codes. Former U.S. Ambassador to Haiti Timothy M. Carney told CNN that Port-au-Prince was particularly at risk because it grew rapidly from a population of about 250,000 in the mid-1950s to more than 2 million today, all with little oversight. City planners had called for the surrounding hills to remain undeveloped in order to protect an aquifer. "That didn't happen," Carney said. "People started building up those hillsides." Instead of building concrete structures, they built shanties, he said. "My fear is that they all fell down."